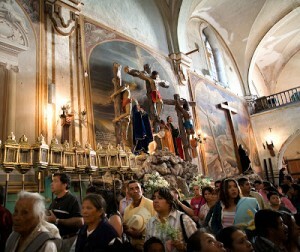 Following an ancient San Miguel tradition, people visit seven churches today to view special altars depicting Jesus before his death and eat various types of bread. The lines to enter can be very long, so visiting any seven can take some time. Luckily outside any church are food vendors. Holy Thursday commemorates several important events of Holy Week (Santa Semana) with masses including the Last Supper, the washing of the feet of the 12 Apostles and the arrest of Jesus. The perfume of chamomile is characteristic in every church. The act of visiting seven churches reinforces the solemnity of the week and San Miguel’s observance of this most holy time. Today the faithful visit churches in any sequence or location they choose. Historically one left the Temple of Good Health to go to Santo Domingo to correspond with St. Peter’s in Rome. Then came the Church of the Third Order of St. Francis, the Parroquia, the Nuns’ Church (Las Monjas), San Juan de Dios, Santa Ana and San Francisco. Lastly a visit was paid to the Casa of Loreto in the Oratory in honor of early Roman church called Vallicella, the first church started by St. Phillip Neri, founder of the Oratory clergy.